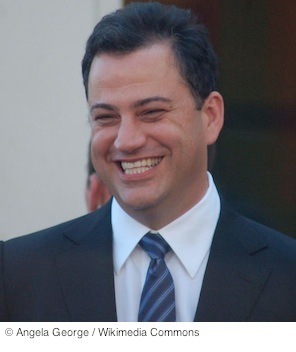 Sometimes it’s hard to tell when Jimmy Kimmel is joking or being serious. Kimmel recently announced on The Ellen DeGeneres Show that he and his wife, Molly McNearney, are expecting their first child together. He also said he likes the name Karate for his new baby. Kimmel also said it’s going to be weird to be a father again at his age (46) and that he’ll be one of those old dads. He told DeGeneres that he’s forgotten pretty much everything about taking care of a baby. He mentioned a visit to see the new baby of his friends, Emily Blunt and John Krasinski, and discovered new ways to do things these days. Kimmel’s first marriage ended in 2002. He started dating McNearney, 35, one of the head writers for his late-night ABC talk show, Jimmy Kimmel Live!, in October of 2009. They announced their engagement in August 2012 and had a July 2013 wedding. This will be the first child for McNearney. Kimmel was born in Brooklyn, New York, and has two younger siblings. McNearney comes from a three-kid household, too; she’s the one in the middle. During The Ellen DeGeneres Show interview, Kimmel said he’s not interested in knowing in advance if the baby will be a boy or a girl; he’d like a surprise. His wife agreed, for a while, then she started thinking about decorating a nursery and her thoughts on surprise changed. Kimmel said he doesn’t think the color of the nursery is any big deal and the baby won’t be able to see it anyway, “right?” He is interested in the baby’s name, though, and he likes Karate. Source: “Jimmy Kimmel: ‘I’m Having a Baby.’” Us Weekly. Us Weekly / Wenner Media. Feb 27, 2014. Web. Mar 7, 2014.